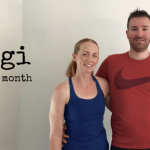 I’m so pleased to share the Jen’s story of how she started her yoga practice and how it has changed with her over the years. 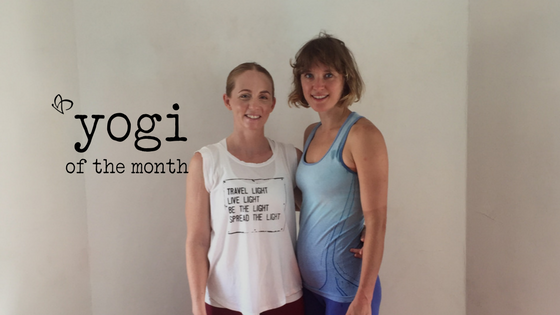 When Jen told me she was returning to Townsville and was super excited to be practising at Live and Breathe Yoga again it made me so happy and of course I wanted her to share her story with you. When and where did you first start practising yoga? I walked into my first yoga class in a packed out sports hall at Wavertree Sports Gym, Liverpool, UK. There must have been 60 people there. I just remember there being a netball court full of humans on mats. At the front stood a real life Indian Yogi, he taught Shivananda yoga and zoomed around Liverpool on his scooter in between his classes. He taught full time, and this was….. ooooooo oh dear…. 14 years ago…I remember hurting so much after that first class and for someone who exercised for two hours, six times a week, this was a little unexpected, but I went back, again and again. My most vivid memory was how he said inhale through your nosils. I still smile about that today and Im sure he still says it to the students he still teaches. My yoga journey after that was a broken one, coming back and going again, but I have always been drawn to the more traditional styles, those rooted in history and discipline. Even though I am only just learning those lessons now myself. Why were you interested in the first place? I don’t really remember, I think, like a lot of people, I just needed to stretch. My addiction to the gym had made my whole being tight and tense. So, I went like so many others… for a “stretch”…. which I have to laugh at now because when people say yoga is just stretching, it makes me want to punch them (in the most yogic way of course). What is it that got you hooked? Honestly, what really got me hooked though, was when my life had one of those “let’s fall apart” moments. I didn’t have the energy to climb, my “thing” at the time. In fact, I was barely even leaving the house those days. I’d pretty much given up. Then one day something made me get up and walk to yoga. It soon became all I had, it was all I could do, it was keeping me alive and it was the only thing that made sense. Then I was hooked, I still would battle with my personal practice (that was 3.5 years ago now) but I was and still am, hooked. What do you love about Live and Breathe Yoga? My gosh, everything, and that stays even after two years away from it. I love the floors, I love how the carpet welcomes you and the polished wood await the gentle roll of the sessions yoga mats. I love the smells, I love the metal water cups, I love the breeze that flows in through the windows. I love the students and how diverse they are, I love chai Saturdays and full primary on Mondays. I love being in there when the sun rises and when it sets. I love practicing next to my friends. I love the space that Allison has created, her home. I love that she is a strong yet vulnerable teacher and one of the best, if not the best, yoga teachers I have had the pleasure to learn from. She has so much to give, and she gets so much from her students and you can feel that. It’s real, the place is alive. I left two years ago and haven’t found another place like it. I’ve missed it more than any other studio I have practiced in and that’s a few by now. Back in the sunny UK I once worked in a yoga studio. I has access to the building and one christmas day, which is cold in that hemisphere, I went and I practiced. I sat on my yoga mat whilst the world around me raced and celebrated, I was home. That’s how I feel when I go to Live and Breathe, home. What benefits/changes have you felt since practising yoga? I think more is what leaves you when you stop. I go through ups and downs, it bloody hard to get on your mat and quite often I don’t. I have ALL the excuses not to, all the reasons why I shouldn’t, and I roll them out think and fast. Then I start to notice my peace fade, a certain calmness inside me slips away. My hips begin to ache and my back begins to hurt. My energy levels change, and I welcome behaviours, patterns and attachments in to my world that I thought I had mastered. I am less kind to my body and I am more likely to put things into it things I know don’t help it thrive. Yoga helped save me from a it of darkness and it still does, when I allow it. How do you stay motivated to keep getting back on your mat? Sometimes it’s easy, sometimes it’s in the flow, in the right location and with the right people and I just up and run onto my mat. Other times It’s harder, and i stop…. for weeks, months… years, then something inside me kicks me up the arse one day and says… YO… YOU! GET ON YOUR MAT… The time gap between “breaks” is getting shorter and I am trying to teach myself to get on the mat even when things aren’t perfect, because lets face it if I wait for that then I may as well use my matt and a weed stopper on the garden! It seems though that I am reminded more and more, by myself and the teachers around me (I’m glad Allison has a blog) to show up, and not for anyone else, but for me. I think once that lesson clicks, the one were you realise you do this for you, it helps you move, it puts you in your place and it keeps you honest. What’s your favourite thing about Ashtanga Yoga? I like the routine, which I never though are words I would say… I likes something routine! I can choose to work on it, or not, but it will always be there, just the same, waiting. Like a loving friend who sometimes makes you cry and often makes you fall on your face. It’s taught me a lot about fear, and how much I hold myself back, and how I was attached to outcome but didn’t want to invest in process. Ashtanga was easy for me when I was strong, but I have always hit a wall when it came to the effort past that. I was never going to get to the harder postures…. because I wasn’t willing to try hard enough, I’d blame it on my body, but the reality is that I am fortunate enough for things to come easy and once they get hard, I run away. Ashtanga has taught me that I cannot run away and when I do I end up back where I started. It is teaching me discipline, slowly, but surely… which is why I’m back, again. What would you say to someone who is thinking of trying yoga? Not to sound like a popular sports brand… but JUST DO IT! You ARE flexible enough to do yoga. Yoga is for anyone and everyone. For you, me, him, her and they (I even have a picture of a cat on a yoga mat… so you know..). It’s just waiting for you to explore it and that’s what you must do. Whether you find your style straight away or move through the many different variations, it’s a journey. Cherish it. Oh, and don’t forget to appreciate your good teachers, you might not always be fortunate enough that have them around you. Which is why I am going to Love the crap out of Allison and Live and Breathe whilst I am back in Townsville. Do it, and don’t give up, even if sometimes you put your mat down. Also, remember, you might hate it at first, my mum did, after one class. I told her not to judge a whole way of living on one class. So she found another one, now she is a dedicated Iyengar student and a shining example of a yogi that I look up to… she’s been practicing for three years and is 66.